Shopbop just did a fabulous lookbook incorporating the 70's trend no matter what your style (bohemian, casual chic, ladylike, downtown, etc). Click HERE to see all of the gorgeous styles. My favorite was the Casual Chic look, which retails for a total of $1472 (the jeans alone are $198). 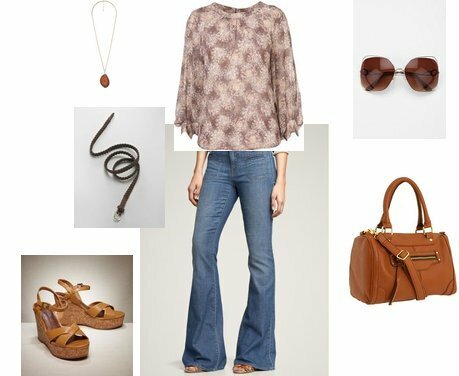 I love the 70's trend and am still looking for the perfect pieces to incorporate it into my existing wardrobe. I think I could easily make this look work for me and my casual style, so I put together a similar look for a lot less cash. My total for this look is $264.38 (you can see some alternative sandals HERE, HERE, and HERE, an alternative shirt option HERE, and an alternative bag HERE). So cute!! SO excited about this trend!! Love what you have put together. Particularly the Urban Outfitters bag! Love hippy chic looks and adore anything in tan leather. I feel some serious shopping coming on. Great post. Love this look and great picks Jen!! gorgeous. le sigh. want, but am on a money diet, so i will just shop with my imagination. Thanks everyone, I'm so glad you liked my version of the look!